Those unfamiliar with or new to beekeeping often ask “What is a beekeeping suit?” If you’ve ever seen beekeepers at work, you know the outfits they wear look rather funny. In fact, they look a lot like something one might wear to defuse a bomb or handle hazardous substances. 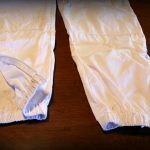 Thankfully beekeeping doesn’t require that level of protection, but a good quality beekeeping suit is an essential tool for anyone working with bees and their hives. The purpose of a beekeeping suit is to protect its wearer from getting stung while working with bees. The best way for beekeepers to remain safe is to understand and respect the danger involved in working with bees and take proactive precautions. Although using a bee smoker will calm the bees and mask alarm pheromones that might cause them to attack, it is still important for beekeepers to play it safe and wear protective clothing when working their hives. A good-quality beekeeping suit provides an effective barrier between the beekeeper and painful, potentially dangerous bee stings. And, as an added bonus, the beekeeping suit also protects the beekeeper’s street clothes from stains and stickiness. To remain as safe as possible when working with bees, a beekeeper needs to be covered in protective wear from head to toe. 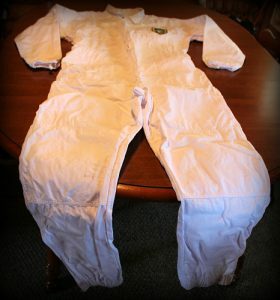 The beekeeping bodysuit provides the largest area of protection because it is a full-length garment that encloses the beekeeper from neck to ankles. It usually has a long zipper down the front, making it simple to put on and take off. A beekeeping suit is typically made of smooth, light-colored, heavy-weight cotton. Since many of the bees’ predators are furry and dark, the texture and color of the suit help keep the beekeeper from being seen as a threat. Colorful designs are also avoided so that the bees won’t confuse the beekeeping suit for a field of flowers. Many beekeeping suits have pockets and loops at the waist for holding tools the beekeeper might need. For added safety, the wrists and ankles are finished with elastic. This creates a close, tight fit the keeps the bees from entering the suit. A thumb loop is often attached to the wrist area as well to help keep the sleeves in place while the beekeeper works. In addition to the zipper down the front, beekeeping bodysuits usually also have a zipper running down the lower portion of each leg. This allows the beekeeper to put on and remove the suit without having to take off his shoes. It’s important to note that a complete beekeeping suit ensemble does not include any foot coverings or special shoes. Beekeepers should always wear sturdy, closed-toed shoes with socks when working with their bees to protect their feet from stings and injury from any of the beekeeping equipment in use. 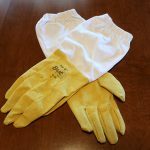 Beekeeping gloves are another important part of the beekeeping suit. Like the suit, they will usually be constructed of a heavy-weight material that is smooth and light colored. Beekeeping gloves are typically long, reaching up to the elbow where elastic helps keep them secure and closes off gaps where bees might get inside. The part of the glove that covers the fingers and hands is often constructed with a softer, suede-like material that allows for greater dexterity when handling the bees. It is important that beekeeping gloves fit properly to provide the greatest control of movement. Over-sized gloves will make it hard to work efficiently. Clumsy movements can lead to dropped tools, bumped hive frames, or crushed bees. And all of these scenarios lead to angry, agitated bees and greater risk for the beekeeper. Arguably the most important part of any beekeeping suit is the beekeeping hat. 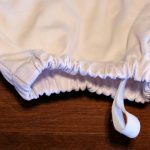 It consists of a wide, sturdy brim to which fabric mesh and/or veiling is attached. The veil hangs down to the shoulders, completely surrounding the beekeeper’s face and neck, keeping the bees many inches away from contact. Beekeeping hats will be part of a complete beekeeping suit ensemble but can also be obtained as a stand-alone item. When included with a bodysuit, the hat will usually attach securely to the suit with zippers and/or hook and loop tape. This creates a solid barrier to keep bees out of the suit and hat. A free-standing hat will typically have longer, softer veiling. When the hat is worn, the veiling that will fall in thick folds around the beekeeper’s shoulders. In this situation, it is the excess fabric that creates a barrier and keeps the bees from finding a way inside. 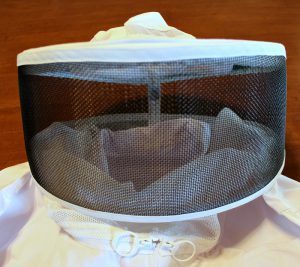 It is important to protect the face and neck when working with bees for two reasons. First, these areas are the most sensitive to the bees’ stingers and the toxins they excrete. Stings around the eyes and nose have the potential to cause intense pain and serious sensory problems. Second, the hive’s guard bees are attracted to human breath. They will be directly drawn to where the beekeeper is most vulnerable. Because of this, even experienced beekeepers who may be confident enough to work without the bodysuit or gloves will still wear the veiled hat to keep the bees away from their faces. What is a Beekeeping Suit? Complete Protection! The three components of a beekeeping suit work together to provide a beekeeper complete protection while working with his hives. The bodysuit encloses the beekeeper from neck to ankles. Long beekeeping gloves protect the hands, wrists, and lower arms. And, most important of all, the veiled hat keeps the bees from stinging the beekeeper’s sensitive face and neck areas. With all the safeguards a complete beekeeping suit ensemble offers, even the most novice beekeeper can work with his bees in safety and with confidence.